I need to start this review with an addendum to my previous comments about Wales being a prolific provider of blues…because so is Scotland, and this latest release in the brilliant initiative to showcase blues from that fine country proves there many sung and unsung heroes of the genre alive, kicking and gigging. Jock’s Juke Joint is a varied series giving a platform for the best of Scottish blues music to prove their worth. Based around the idea of a fictitious Scottish Juke Joint, the collections feature everything you’d imagine in such an institution. Please don’t think this is ‘just another compilation album’ as this one has a real and meaningful purpose…the celebration of Scottish blues at its very best, steered by the Edinburgh Blues Club for the last 6 years. 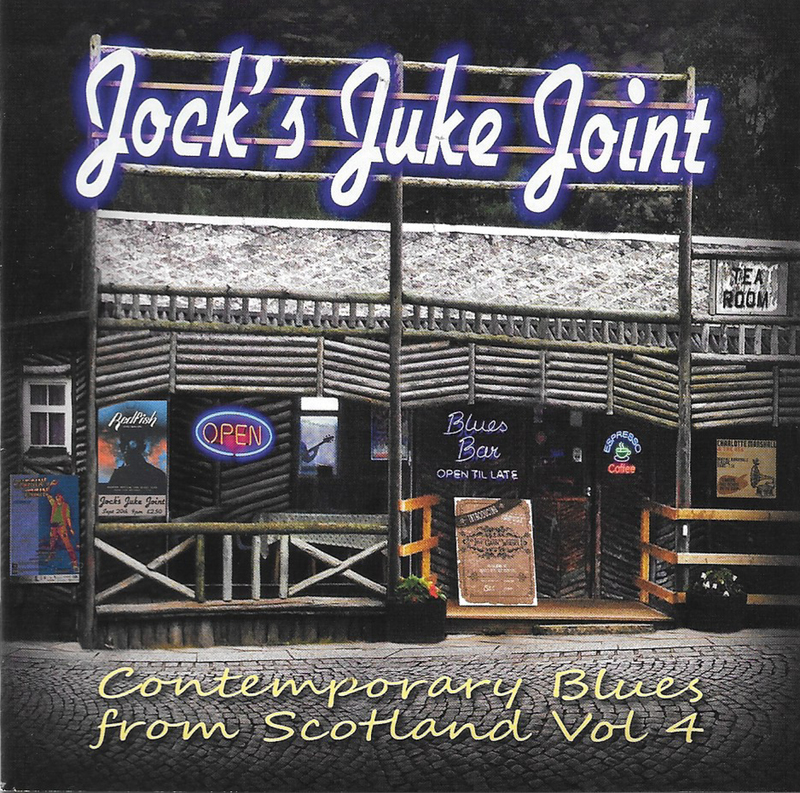 Scotland has produced many notable performers in blues and virtually every other genre, from heavyweights like Alex Harvey, Nazareth and Frankie Miller to The Nimmo Brothers and the inimitable Dave Arcari, and this latest release, Jock’s Juke Joint Volume 4, gives us the opportunity to hear some of the current artists; be they established or up and coming. It is appropriate that this compilation starts off with the title track of Andy Gunn‘s album, Too Many Guitars To Give Up Now, previously reviewed here on Bluesdoodles, where we said “Too Many Guitars explains how Gunn was absorbed into the blues. He name-checks Little Richard, Fats Domino and then goes all Chuck Berry on the solo”. While we’re talking of previously reviewed artists, we also looked at Wily Bo Walker’s excellent ‘Transparent Blues’ release…in saying that, the track here was a single and not on that album. Velvet Windows, equally as good as he takes a traditional approach with that new feeling that Wily is so good at. His rugged vocals combine with superb guitars, horny horns to match the lyrics and neat percussion throughout. Next, from their 5×5 EP, Redfish contribute Immaterial Man…it’s a lovely piece of class R’n’B with a keyboard led song that conjures the likes of the Mayall and Auger with the benefit of a tight and capable guitar and rhythm section. Melisa Kelly and the Smokin’ Crows share a track from their debut, Devil’s Luck. On I’m The Boss, Kelly’s distinctive vocals are soulful and strong backed by a skillful band and a brass section of considerable power. The Simon Kennedy Band is a trio with a slight difference…comprising guitar, drums and organ they make a hell of good noise on All Or Nothing from an album due to be released early in 2019. This is full of harmonies with keys and guitar work with a great tone promising much for the new album. Multi instrumentalist, singer-songwriter Stoney Broke aka Jake Scott contributes Got It, his latest single under The Stoney Brokes banner. Mainly acoustic but with drums and bass and electric guitars (especially the solo) added to bring a depth to a damn good not quite blues song. The Lynsey Dolan Band is up next with soulful vocals on I Won’t Bring You Down; inevitably compared to Maggie Bell and the like, Lynsey proves that her vocal talent has her own individual sound that, when backed by a quality band like this puts together a song that is heavily riffed and yet the harmonies and sparseness during the verses brings a bit of pop to the proceedings. Al Brown and The Blue Lighters bring us some true blues with a slow and burning tale; Caller Unknown benefits from some neat double bass and tasteful, laid back guitar. Now for a band named after a line of tarmac that runs along some of the most beautiful coast in Scotland and passes St. Andrews too. They aren’t middle of the road however as the 5-piece Mike Bowden and the A917 Band give us some authentic and funky blues with a Latin tint on Poor Man, the electric solo over acoustic works well. Charlotte Marshall and the 45s bring their blend of jazz and blues to the mix. The quirky Bootleg Liquor features sax and vocals which are playful and, if I am right, a bit risqué but so rapidly sung I could be wrong. A singer, songwriter and guitarist next as Andrew Robert Eustace performs Broken Down and Beat with emotion and the guitar work is astounding as he uses the acoustic on top of drums and bass to great effect…this is quality blues approaching blues-rock. Used Blues bring Pebble By Pebble to this varied table and gives us the spirit of a Juke Joint. The harp playing is skilful and the jaunty tune draws you in. Sidewinder Blues from Five Grain Whisky may suggest a blend but is closer to a single malt in its blues grounding…a traditional approach with nifty guitar runs and a keyboard solo of skill and pace. Liz Jones & Broken Windows contribute the ballad, Broken Windows giving us saxophone breaks and a guitar solo of real class, but Liz Jones is the star whose jazz-infused vocals put a sincere touch of the blues on this one. Chasin’ The Train supply a song called Temporary Man that starts with a true acoustic slide blues introduction before exploding into a harp-driven, rocker that is huge fun with the slide and harp complimenting each other all the way through and the solos are good. Black Cat Bone are apparently an ‘Alt Blues Rock Band’ and on Morning Light they show the fuzzed approach to the blues. The riff is one of those sounds like…many things but, importantly, it works in this case and this is blues with a heavy touch even when the harp solo arrives somewhat unexpectedly. After a couple of listens, this is actually a lot cleverer and fulfilling than I thought. Full Fat also have the same Alt Blues band label but remind me more of Free in the way bass is so expressive. On Temper Temper they show inventiveness with the rhythm changes and quality musicianship even when the odd stutter appears it fits. Final track honours go to guitarist, composer and producer Neil Warden who, on The Alchemist, utilises a lovely toned acoustic, combines it with bass and flute to reveal eastern influences and, although not blues as such, it is atmospheric and entrancing. Overall, this sampler is a treasure trove of Scottish blues…if you see any of them advertising a tour, on this evidence, they are all well worth checking out and that is the point of the album: to give an airing to the up and coming talents and, hopefully, expand their fan base. As a standalone album, you will not be hitting ‘skip’ that often as there is a lot of styles and approaches to keep ones interest and perhaps to explore the artists output further.